The Mayor gave a heartfelt message of encouragement and support for the work Templesprings is doing in the community. “I was born in a council flat in South Ockendon and I’m still living in a flat in South Ockendon and am I’m mayor of Thurrock. I went into this young man’s school – David-Elijah Johnson and he showed me round his school as he’s the head boy. And about 2 weeks later, I get this fantastic email from him asking me to come here. Well I never knew this existed, I’m ashamed to say I’ve lived in South Ockendon for 60 odd years and I didn’t know Templesprings existed, my apologies. Templesprings music center organised a festive fun and celebrations day on Saturday the 12th of December 2015 at their new premises. In attendance was the Mayor of Thurrock Cllr Sue Gray and Mayor’s consort Tony Lane. The line-up included a music mini concert where the young people showcased their talents and what they have been learning this term at Templesprings; the Kids choir led by JB Rose, dance act, Lisa Chuma an entrepreneur who spoke about the impact of coaching, other supporting acts and Santa’s grotto for the family. The founders Derin and Bidemi Johnson thanked the parents for the opportunity given to help shape their children’s musical journey and impact their lives positively. Templesprings Music Centre in Thurrock are delighted to announce that BBC Children in Need has awarded them a grant of £29,550 over 3 years. This grant will fund the running of holiday clubs during the February half term and Easter holiday periods and help make a difference to the lives of disadvantaged children and young people right here in Thurrock. The Holiday Club offers an inclusive community atmosphere in which children are supported to express themselves, support others, build their confidence, self-esteem and key personal skills. The activities on offer will include masterclasses in arts, drama, dance, music, singing, cooking, fashion design and team building including a local excursion. The project is entirely young people led with support from experienced coaches. Christmas 2018 with the support of Giving World all of us here at Templesprings were able to spread the joy of Christmas to local families in the area. Here is just a small clip showing the work that went into creating the hampers that we donated. Templesprings Music Center was invited to the first joint Harris Academy and Harris Mayflower PTA Summer Fete on Saturday July 15th 2017. It was a big stage for our kids and all of them rose to the amazing challenge of performing to a large Fete Crowd of cheering mums, dads and visitors. Templesprings music center organised a festive fun and celebrations day on Saturday the 12th of December 2015 to launch the opening of their new premises. In attendance was the Mayor of Thurrock Cllr Sue Gray and Mayor’s consort Tony Lane. 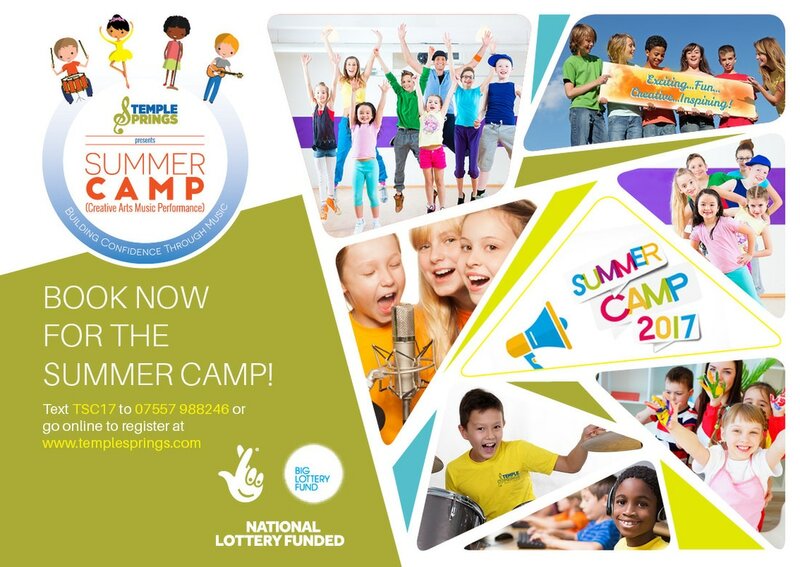 Templesprings is grateful to the Big Lottery Fund for making the Summer Camp possible. We hosted 30 children over two weeks offering children aged 5 -14 years a unique experiential learning opportunity that helped build their confidence and self-esteem.